It’s easy to see why the idea of a Caribbean wedding is so popular: sun-drenched islands, a relaxing atmosphere, luxurious resorts and a truly welcoming atmosphere. Whether you’re looking for the romance of an intimate beach ceremony or a larger celebration with family and friends, there is something for everyone in the Caribbean. It’s certainly hard to beat the stunning backdrop of soft white sands, lush tropical rainforests and colourful island architecture as a setting for your big day. What’s more, the relaxed, laidback culture, delicious food and famously friendly island hospitality will be the icing on the (wedding) cake, ensuring your dream becomes a reality. There are so many excellent hotels and resorts in the Caribbean to choose from, each with a dedicated team devoted to granting your every wish. Whatever your budget there is a full range of options, from purse-friendly packages right up to extravagant tailor-made affairs, all benefitting from the expert guidance and direction of a wedding planner who has many years of experience. It is their full time job to ensure that you have the best day of your lives, and their wisdom is something you can safely rely upon. Once you’ve set your heart on a Caribbean wedding, the first decision you have to make is where you want to tie the knot. The size of your ceremony and wedding party will have a bearing on this, so consider the scale carefully. Will it be just the two of you on a private beach or will you be inviting a larger gathering of friends and family to share in the festivities? Some hotels and resorts are more suited to accommodating larger groups, or are ideally situated with other hotels close by where your invited guests can stay. Many couples choose to stay in one hotel or resort, perhaps in a more luxurious property, with the rest of the wedding party staying nearby in a more modestly priced hotel. This gives everyone the chance to spend time together without being in each other’s pockets or blowing the budget on the roof over their heads, while the happy couple get the opportunity to relax and indulge themselves in a little luxury. Some of the best islands to host your dream tropical wedding include Jamaica, St Lucia, Antigua, Barbados, Grenada and Turks & Caicos. Each has its own unique charm and, more importantly, gorgeous romantic settings. 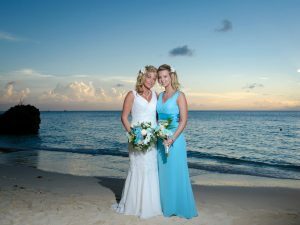 Ranging from the majestic Piton Mountains in St Lucia or the historic English Harbour in Antigua, to the beautiful Grand Anse Beach in Grenada, it’s not difficult to find the perfect backdrop for your wedding photographs. A wealth of perfectly white, sandy beaches provide a pristine setting for simple, barefoot ceremonies; all you need is an elegant white dress, a light linen suit and each other. For larger, more lavish events, a greater degree of organisation may be required, such as floral archways and beribboned chairs, beautifully decorated tables, stunning bouquets or even a steel pan band. The options are endless and your wedding planner will do all the hard work for you. Just sit back and enjoy the rum punch! If you want to go down the traditional route of a church wedding, the Caribbean islands are largely Christian and as such have a number of churches and chapels you may want to consider. Most island nations require that the couple have spent at least three working days on the island before the ceremony to ensure all the legal paperwork is in place. This is beneficial as it allows you to fine-tune the arrangements with your wedding coordinator and ensure that everything smoothly on the big day. Simply Caribbean is renowned for its personal service and attention to detail and we’re proud to have won awards for our wedding and honeymoon offerings. We have helped countless couples tie the knot in the Caribbean and would be delighted to create your perfect day just for you. Whatever stage you’re at with your plans, contact us now on 01732 810372 to discuss how we can make it happen.